Lego Minifigures (sometimes abbreviated as "minifigs") are small, plastic figural toys produced by Danish toy manufacturer Lego, which are customarily sold with Lego sets, as characters intended to populate modular Lego environments. When first released in 1974, Lego minifigures were at the same scale as the current minifigures. However, these figures had solid torsos without separate movable arms, solid lower body pieces that were not moveable, and heads without printed features. The first modern minifigures were released in 1978. For the next 11 years, minifigure heads were produced with a simple facial expression, rendered as two solid black dots for eyes and a smile, also painted in solid black. 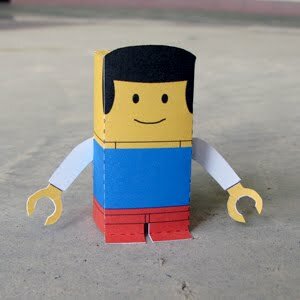 Download the PDF file here and make your own Minifig!